A dépanneur is another one of those things that we in Quebec have that other North Americans don't. Much like a convenience store or corner shop, a "dep" is more than that: A one stop shop, for snacks, alcohol, magazines – and anything really at virtually any time – it is a quintessential pit stop and at times last-minute lifesaver (hence the name). Located on a subtle corner, a short walk from Little Italy and near Mile End, I had heard the buzz surrounding Dépanneur Le Pick-Up a few years back. With the idea of taking dépanneur culture to another level by turning it into a sandwich joint, the chatter was spot on – this place is a hit and one that I've been subsequently returning to. Since opening in 2009, this friendly, laid back eatery has become a go-to for nearby residents and Montrealers looking for a casual, inexpensive lunch. The clientele ranges from students looking for a cheap eat, to business workers on lunch hour, to neighbourhood families with children. From the outside, Le Pick-Up looks like a dep that you may have found on a street corner in Montreal during the fifties, and the inside exudes the style of the seventies with eclectic, neon decor, a disco ball hanging from the ceiling, and vintage posters on the walls. For under $10, I was well-fed with a hot pulled pork sandwich slowly cooked in BBQ sauce. Likewise, I had the opportunity to try their chipotle club sandwich with smoked mayo, which adds a kick to the classic combination. Vegetarians, the pulled pork sandwich comes in a meatless option and the spicy eggplant & pepper combo is sure to please. 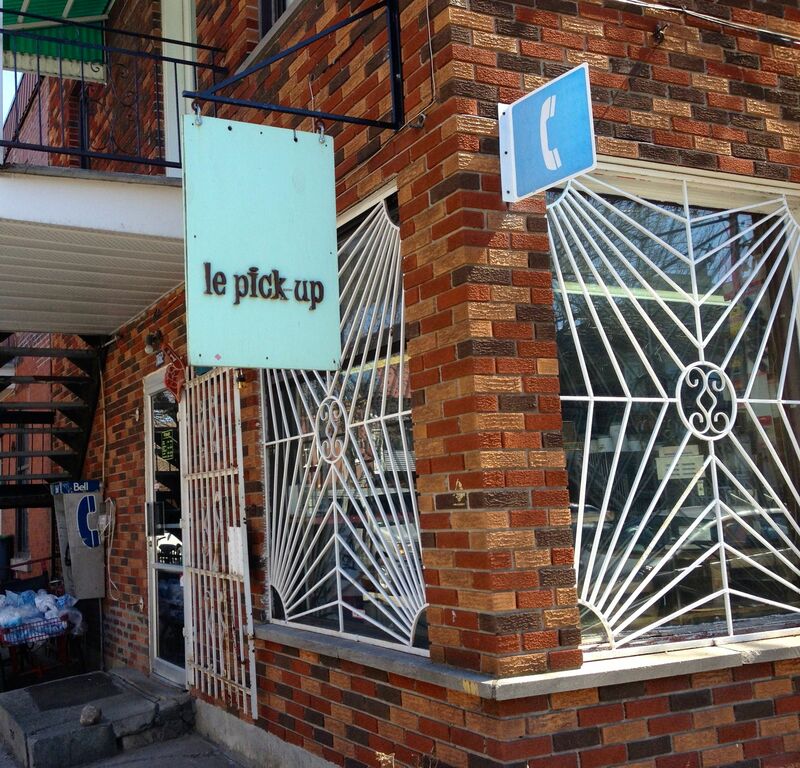 Le Pick-Up also serves soups, salads, breakfast, and don't forget to end your meal with coffee and dessert. A line-up does begin to form throughout this tiny spot during peak hours, although waiting the queue here can become quite productive: Pick a drink out of the freezer or better yet, kill time by checking a few items off your grocery list. 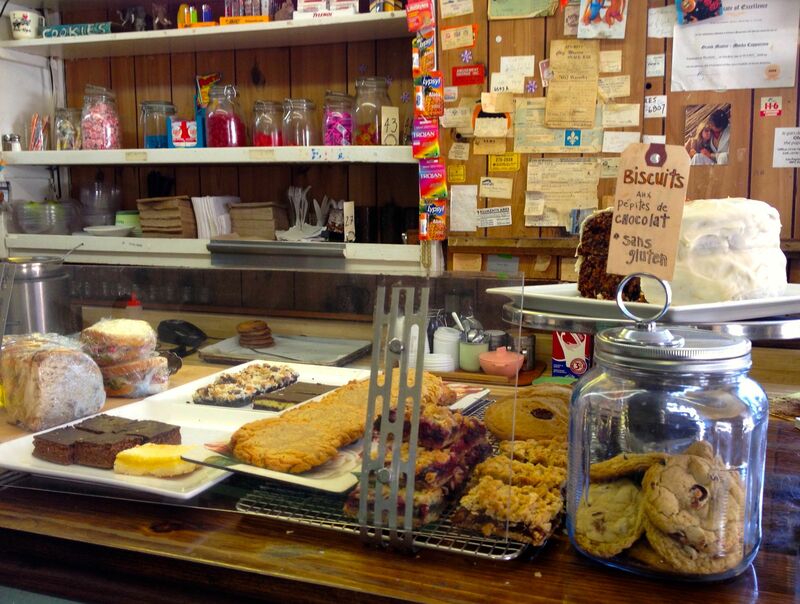 As any dépanneur, le Pick-Up sells cereal, baking supplies, chips, beer, candy, and plenty more. You can even browse their selection of homemade zines displayed on a rack near the cash register. If you're fortunate enough to snag one of the limited indoor picnic tables, watching the line shape around you becomes part of the overall experience. Otherwise, pull up a stool at the bar or opt for outdoor seating on warmer days. Very cool. I'm going to check this out.